DOACs are a relatively new class of oral anticoagulants used to prevent blood clots. Warfarin is the traditional treatment, however its narrow therapeutic index and many contraindications with other drugs and foodstuffs means that it can be problematic for the patient. DOACs overcome many of the problems associated with warfarin. Dr James Uprichard is Consultant Haematologist and Honorary Senior Lecturer, Centre for Haemostasis and Thrombosis, St George’s University Hospitals NHS Trust. 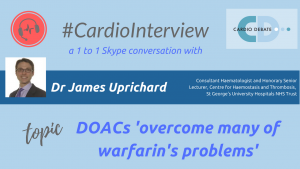 Here, he talks to Cardio Debate about the challenges and advantages of using DOACs. Q1: What are the benefits of DOACs compared to other anticoagulation therapies? Oral anticoagulation is very important. There is an increasing need for DOACs because of the rising prevalence of atrial fibrillation and venous thromboembolism in our aging population. We know the anticoagulant of choice, warfarin, works very well. It reduces the risk of stroke by about two thirds. It is highly efficacious. Unfortunately, about half the patients who would benefit from this – i.e., half the patients who have no atrial fibrillation and suffer a stroke – have not yet received any kind of anticoagulant. And we also know that patients who are diagnosed with atrial fibrillation would benefit from anticoagulants, and we could prevent about 5000 strokes in the UK every year. So as I mentioned we have had warfarin for about 60 or 70 years, and it works very well. The trouble is, warfarin is a very difficult drug to take. It requires frequent blood tests in the form of monitoring International Normalised Ratios, the so-called INR. And there are therefore subsequent dose-adjustments of warfarin based on the INR. There are unpredictable pharmacokinetics with the drug of warfarin, with a slow onset and slow offset, and this is a big problem. And of course, there are many interactions of drugs in the formulary and foodstuffs with warfarin. Thankfully we now have the DOACs, direct oral anticoagulants. And these have been designed to overcome many of the problems of warfarin. They have a predictable effect with fixed dosing, and there is no need for regular blood tests, frequent blood tests the patients complain about when they come to clinic. And we know from very large Phase III clinical trials in atrial fibrillation and venous thromboembolism that these drugs are at least as efficacious as warfarin, and at least as safe. We also know that when we look at atrial fibrillation there’s an approximately a 19 or 20 percent reduction in the risk of stroke using DOACs compared to warfarin. There’s a 10 percent reduction in all-cause mortality. And importantly when you talk to patients, what they are really concerned about is bleeding into the brain and intracranial haemorrhage. There is a 50 percent reduction using the DOACs compared to warfarin. In the field of venous thromboembolism there is a 40 per cent reduction in the risk of major bleeding using these drugs compared to warfarin. I think they are highly beneficial. Q2: What are the current strategies to move from warfarin to DOACs at a national level? At the time when this was produced, the NICE Guideline only mentioned apixaban, rivaroxaban and dabigatram, because the fourth DOAC – edoxaban – had not yet been licenced. But since then there has been an update in 2016 that states all four DOACs must be included in local formularies because they have been given NICE technology appraisals and therefore they should be available without extra funding or formula restrictions. In fact, things have moved on somewhat since then because we have the NHS Five-Year Forward View, NHS Right Care, which says ‘patients who require anticoagulation to prevent atrial fibrillation related to stroke should be offered all of the available NICE options.”  Obviously this includes warfarin as well as all the direct oral anticoagulants. The patient and the clinician need to have a full and informed discussion about the risks and benefits of all the agents so that there can be an informed decision about the most suitable option. This decision clearly needs to take into account the licence indications, the patient characteristics and patient preferences. Q3: Will the availability of antidotes help with the transition to DOACs? When DOACs first came to the market there was a great reluctance to use them, and this was in part due to the perception that patients who used them would bleed uncontrollably. Warfarin has its own reversal agent in vitamin K, but even when vitamin K is given intravenously it still takes hours to work. And of course, although we have prothrombin complex concentrates, these are not reversal agents as such, these are clotting factors which are needed but they don’t actually reverse the effects of warfarin itself. DOACs have quite a short half-life and so they can be out of the circulation very quickly. Therefore, in many situations just stopping the drug may be all that is needed. And we mustn’t forget that bleeding, and particularly the feared intracranial bleeding is very much reduced. We know that fatal bleeds are approximately half as likely to occur with a DOAC than they are with warfarin. Now you mentioned these reversal agents, and undoubtedly the appearance of the reversal agent idarucizumab, which is based on a monoclonal antibody to dabigatram, has allayed many fears about bleeding and has helped physicians to be more comfortable in prescribing the DOAC dabigatram. An application went to the Food and Drug Administration in the United States, on the 67 patients included in that study. The FDA asked for more data and the study is currently is ongoing. Importantly there is no surgical cohort, but andexanet alfa looks very promising and I hope that we’ll have good news soon. Ciraparantag is an almost universal reversal agent which looks promising in early phase trials. And in fact, the future I think we are going to have is Armagen-like forms of factor Xa, which are drugs with long-lived proteases in the circulation, they’ve been specifically engineered so that inhibitors like antithrombin won’t neutralise them. I think this is all going to help patients and doctors, because although in reality the need for reversal agents in clinical practice is unlikely to be as great as originally thought, I think that their availability in clinical practice will encourage more use of the DOACs, which I think is a very good thing.